Oftentimes clinicians will choose to convert a patient’s existing complete denture or a treatment denture into an interim fixed implant‐supported prosthesis. A chairside conversion is done to get the patient accustomed to a fixed prosthesis. Furthermore, it’s also done to monitor patients’ oral hygiene habits before they receive their final prosthesis. This process also helps the clinician and patient detect any potential issues they may run into once the final prosthesis is in place. 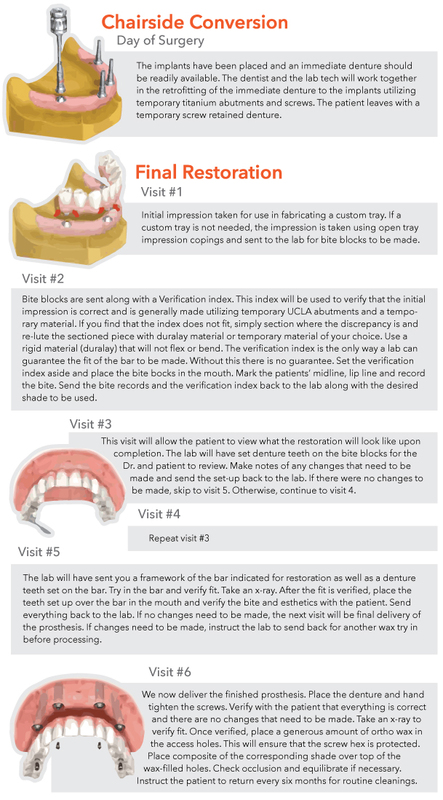 Chairside conversions are a great way to help patients adjust to a new implant. It is not only convenient but also practical when introducing a patient to a dental restoration. Mobile 3D Imaging is a tool you can use to further simplify this process (or essentially any other process requiring a CT Scan). This service offers a CT Scan facility right in front of your office, your patient’s home, or your patient’s workplace! Mobile 3D Imaging is an extension of your practice. If you would like to learn more about Mobile 3D and/or setting an appointment with them online, click here!